The Turbo floor model dryers feature an all steel fabricated base for improved stability and less vibration. 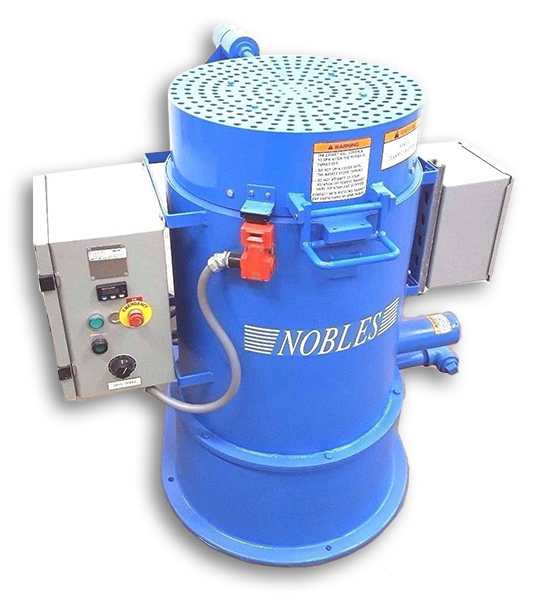 All Nobles floor model dryers use a magnetic disk brake motor which provides better stopping and reduces down time. T6 - 6" x 6"
T22 - 12" x 12"
T28 - 12" x 18"
T88 - 18" x 18"
T231 - 23" x 18"
T303 - 30" x 24"
Overall Height 19.75" 33" 39" 39" 37" 40" 40"
Basket Size 6" x 6" 12" x 12" 12" x 18" 18" x 18" 23" x 18" 30" x 24" 30" x 24"
Shipping Weight 68 lbs. 491 lbs. 538 lbs. 610 lbs. 1600 lbs. 2300 lbs. 2400 lbs. including basket* 7 lbs. 75 lbs. 100 lbs. 150 lbs. 250 lbs. 500 lbs. 800 lbs. Oakland Manufactures a full line of baskets to handle any drying applications. Sold separately, baskets are available in 6" x 6", 12" x 12", 12" x 18", 18" x 18", 23" x 18" and 30" x 24"; in various materials such as stainless steel, polypropylene, a stainless/poly combination, and a wide range of meshes and perforations.